I'm so excited to show y'all what I've been working on--a gallery wall of mirrors in my bedroom. Our master bedroom has been a work in progress for a long time. I've been happy with part of the decor, but this wall had always stumped me. One lonely mirror hung above the candle lamp, and that was it. I never really liked the clock very much, so I decided to experiment with it. I used a hacksaw to cut off the crown at the top. Much better! Then I popped the clock works out of the back of the frame and used Krylon's Looking Glass spray paint to transform the glass into a mirror. Presto! Free round mirror! Last, I wanted an antique mirror of some kind, but I couldn't find one that fit my price range. Then I remembered the lovely old-looking frame of a piece of art I was no longer using. I popped the art out of the frame and created an antique-looking mirror with the Looking Glass spray paint. I simply gave the glass several ultra-light, uneven coats of paint, then drizzled a bit of white vinegar on the paint and wiped that away. I added a few scratches for good measure, and voila! An instant "antique"! Armed with a collection of seven mirrors, I set out to arrange them on the wall. For this step, I left the large oval mirror in the center of the wall and traced around the other mirrors onto brown paper. Then I stuck painter's tape to the back of the brown-paper cutouts and moved the cutouts around until I found an arrangement that pleased me. After that, I simply hung the mirrors right on top of the brown paper cutouts. Once the mirrors were in place, I removed the paper from the wall. I highly recommend making the paper cutouts. So much easier than moving the real mirrors around! These photos give you a clear view of our "chandelier," better known as a ceiling fan. It's too hot in North Carolina for me to surrender the ceiling fan in my bedroom! 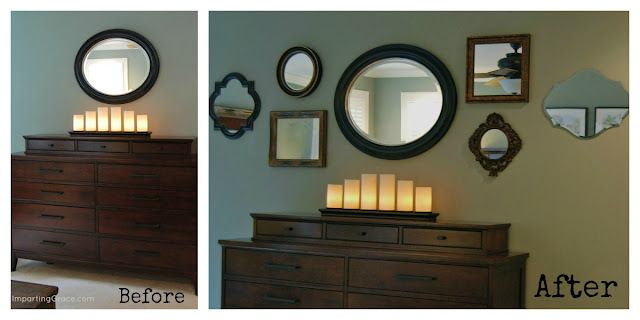 I'm happy with the look of seven mirrors, but one of the wonderful things about gallery walls is that you can add to them or take away from them over time. We'll see how long the wall lasts just like this! I made our bedding; you can read about it here and here. My husband really likes the new wall arrangement, which makes me happy. It's his room, too! And I'm so pleased with the change. What do you think? Note: Bedroom wall color is Sherwin Williams "Mystery Green," a wonderful bluish-greyish-greenish color that looks different depending on the light. So cool! For some reason, I can never seem to find any of that looking glass paint in my town. I think I'll have to try a little harder now! Beautiful! Perfect blend of "more" without looking cluttery. Your wall of mirrors is fabulous, I love how you made two more out of house finds. Visiting from Savvy southern Style it is easy to see why you were a top three pick. I am a new follower. Enjoy your new look in your bedroom! A gallery wall of mirrors looks terrific in your bedroom. I'll bet they reflect light and make the space brighter, too. Your were clever to make your own mirror with looking glass spray. Your gallery wall looks amazing! I love the tip about using the paper to decide where to put everything...and how cool that they make mirror spray paint! How pretty! I am glad you showed your wall of mirrors because that looks like the solution to a problem wall here at my house. The entire room looks beautiful. 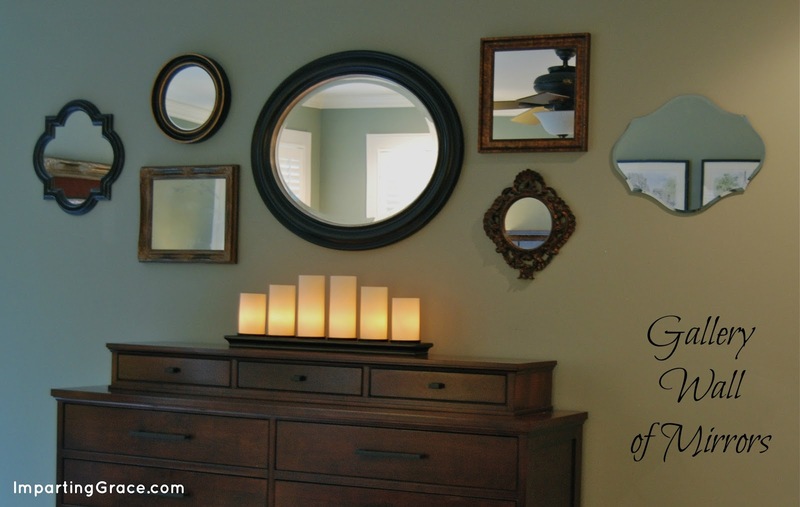 LOVE your gallery wall of mirrors!! Your bedroom is so pretty! I love that wall color! And I'm right there with you about the "chandelier." I can't give up my ceiling fan either!! It's beautiful, Richella! How did you like the looking glass spray paint? I have a can but haven't used it yet, but it sure looks good! It looks beautiful. Love the darker framed mirrors against the "mystery green" wall color. Nice job. I love it, such a great idea and was so smart to do your own mirrors. That spraypaint must be popular because I never see it. lol! Love your dresser too! That looks wonderful. I love that you used what you had. Amazing. Your bedroom looks so warm and cozy. Great job.